Strong cash flows and juicy dividends set these biotech stocks ahead of their peers, but which is the better pick now? Retirees who don't want to go back to work should avoid biotech stocks with the exception of a select few. Even though developing new drugs is a risky business, Amgen (NASDAQ:AMGN) and Gilead Sciences (NASDAQ:GILD) produce steady enough cash flows to offer dividend yields of 3% or better right now. Both these stocks can boost the income your portfolio receives, but which will end up paying more over the long run? To find out, let's compare strengths and weaknesses that will determine just how much higher they raise their payouts in the years ahead. The Nasdaq Biotechnology index tumbled 21% during the fourth quarter of 2018, and the carnage dragged Gilead's stock price so low that it offers a juicy 3.3% yield at recent prices. Last February, Gilead gave shareholders a 10% raise, and the next payout bump should be right around the corner. Amgen announced a 10% payout several weeks ago, so the 3% yield the stock offers now probably won't budge again until December. Strong cash flows and well-funded dividend programs suggest more payout bumps ahead. Fierce competition for hepatitis C treatments has cut Gilead's profits in half over the past few years. 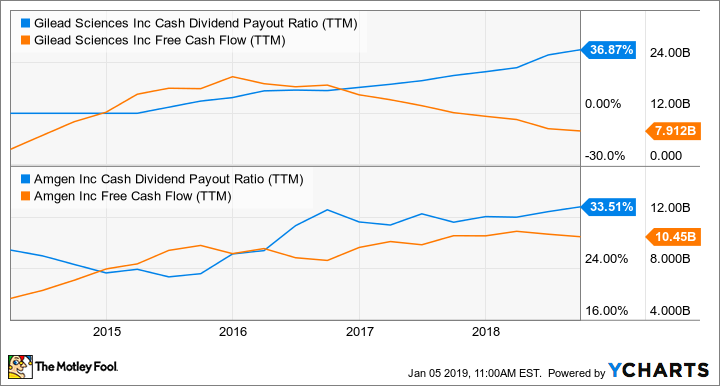 Gilead still generated $7.9 billion in free cash flow over the past 12 months, and it needed just 37% of those profits to make dividend payments over the same period. Amgen has aging products losing ground to competition, but it's been able to offset the losses with more recently launched drugs. Despite raising its payout a whopping 137% over the past five years, Amgen's only used around a third of free cash flow to make dividend payments over the past year. Rather than commit to big payout bumps during times of uncertainty, both companies are fond of funneling excess cash toward share buybacks. Amgen lowered its outstanding share count a whopping 11.8% in 2018. Gilead didn't have as much spare cash to work with and repurchased just 1.1% of its shares over the same time frame. Curing hepatitis C virus (HCV) with a 12-week course of Gilead's Harvoni used to cost around $94,500, but competitors keep launching drugs that are nearly as good at deep discounts. In one of the more surprising moves last year, Gilead launched generic versions of its own drugs that get the job done for just $24,000 in most cases. Chasing each other to the bottom hammered Gilead's HCV sales from a peak of $19.1 billion in 2015 to an annualized $3.6 billion during the third quarter, but there are a couple bright sides to Gilead's HCV meltdown. In addition to more accessibility for hepatitis patients in need, at just 16% of total sales, it isn't a major headwind to overcome anymore. Amgen is a larger ship heading into a different storm. Its top two products are over the hill in drug years and facing competition from lower-priced biosimilar versions. Sales of Enbrel, an anti-inflammatory drug, and Neulasta, a white blood cell booster, both dropped by single-digit percentages during the first nine months of 2018. Amgen relies on these two treatments for 43% of product sales, and their continued decline will hound Amgen's income statements for years to come. Fortunately, Amgen has products on the way up that appear more than capable of offsetting the losses and driving steady growth over the long run. Last May, Amgen launched Aimovig, the first of three new migraine prevention drugs currently available. Amgen made the most of its head start and started around 100,000 new patients by the time Teva and Eli Lilly launched similar treatments in September. With millions of potential patients and a big head start, Aimovig could add billions to Amgen's top line within in a few short years. At the moment, denosumab is helping offset Neulasta and Enbrel losses. Marketed as Xgeva and Prolia to different patient groups, the bone density drug saw its sales surge 15% on the year to $3 billion during the first nine months of 2018. Gilead's biggest growth driver at the moment is Biktarvy, a single-tablet HIV treatment approved last February for patients responding their current antiviral therapy and patients new to treatment. To begin treatment with Biktarvy's main rival, Juluca, patients need to try another treatment first, and it looks as if they're choosing Gilead's drug. Biktarvy sales reached $606 million during its first seven months on pharmacy shelves, and it could achieve $6 billion annually by 2024. Gilead could have another drug worth several billion in annual sales in late-stage development. Filgotinib is a bit behind similar rheumatoid arthritis treatments on the development timeline, but it appears to work as well as similar drugs without signs of a life-threatening side effect. Olumiant, which is already approved, and upadacitinib have been associated with deadly blood clots. Filgotinib has a clean safety profile, and it could quickly rise to the top of the pack if it stays that way. Amgen's tempting at recent prices, but heavy reliance on drugs with sinking sales could be a problem. With hepatitis C losses in the past, Biktarvy and filgotinib have a clear runway to propel Gilead Sciences into the clouds. That makes Gilead the better stock to buy right now. Check out the latest Gilead Sciences and Amgen earnings call transcripts.